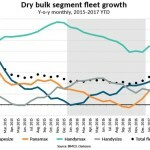 The dry bulk market faced a lot of headwind in 2015 as dwindling demand and over-supply created very unfavourable market conditions. 2016 has shown no improvements so far and prospects for the rest of the year are not looking promising. 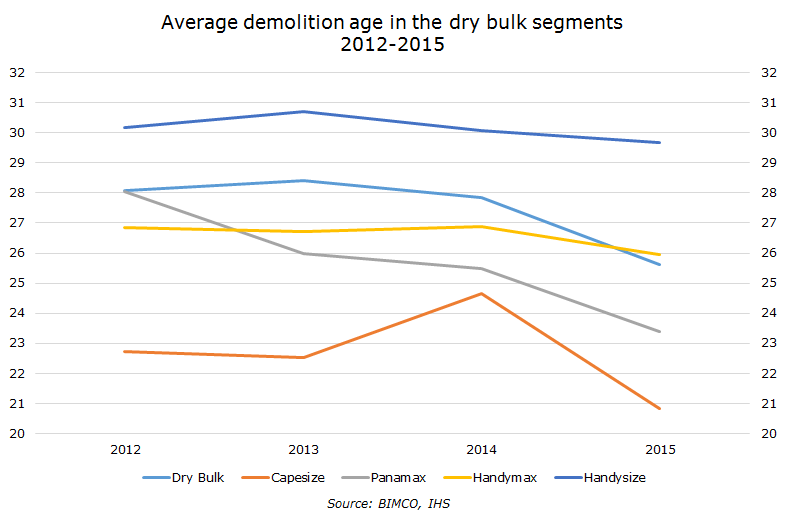 With poor earnings across the board the average scrapping age has dropped among all the dry bulk segments. The capesize segment especially has seen a big drop in the average scrapping age; dropping almost four years from an average age close to 25 in 2014 to less than 21 in 2015. This is the result of a record amount of capesize tonnage that was scrapped in 2015. 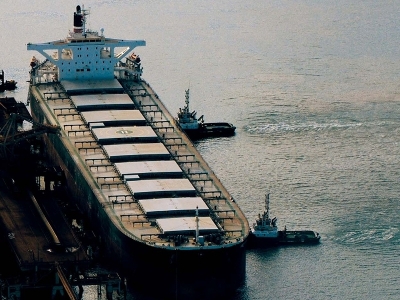 Chief Shipping Analyst, Peter Sand says: “Despite a relatively low demand for scrap steel in 2015 the demolition of dry bulk ships was high compared to previous years, and the capesize segment was the leader of the pack. 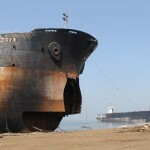 A total of 15.5 million DWT of capesize tonnage was sent for demolition in 2015 – more than half of the total 30 million DWT of dry bulk tonnage scrapped. The average demolition age follows the state of the market or at least the sentiment in the market. 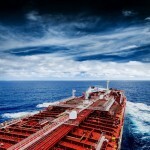 2013 was one of the most volatile years for dry bulk shipping. After a very weak first half, things got better towards the end of the year. The improvement was partly due to some intensive stockpiling ahead of the Indonesian ban on exporting unprocessed mineral ores, posed to go into effect from the beginning of 2014. 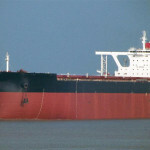 As the ships were kept busy towards the end of the year scrapping remained low and the average demolition age climbed slightly. In 2014 the tumbling demand from import giant, China, hit the market hard. With an increase in hydropower generation, Chinese imports of thermal coal including anthracite, became the biggest disappointment, despite lower prices. Dropping from 192 million tons in 2013 to only 165 million tons in 2014. This development continued into 2015 where imports reached another low of only 108 million tons. Iron ore prices also dropped, however contrary to thermal coal, buyers took advantage of the low price, and volumes rose. Unfortunately, short-haul trading out of Australia covered almost all of the new demand. 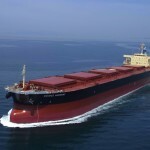 With demand growth mainly skewed towards iron ore, a trade mostly covered by the capesize segment, meant that only few capesize ships were scrapped. 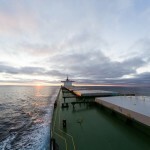 Only 4.2 million DWT worth of capesize was scrapped in 2014, much lower than the 7.9 million DWT scrapped in 2013 and far below the 12 million scrapped in 2012. This resulted in a significant increase in scrapping age for the capesize segment in 2014.